The Boxer is intelligent, alert, fearless, loyal and self-assured. Boxers are very extroverted with high levels of energy and they are often boisterous. This breed are bright and friendly when playing and are determined and brave when aroused. Boxers can be distrustful of strangers and make good watchdogs and guard dogs. They respond well to firm consistent discipline and training. Boxers make excellent companions for adults and children. 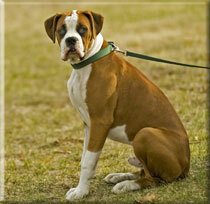 The coat of a Boxer is easily cared for and regular brushing will eliminate moulting. Boxers require substantial exercise. They enjoy playing and romping with other dogs and will happily play with a ball with their owner. When they're adult dogs you can let them run beside a cycle, as a form of exercise. A Boxers concept of exercise is that life is to be lived at speed. Boxers are not particularly greedy dogs, but their appetites need to be controlled to prevent them becoming overweight. The Boxer originated from the Tibetan Mollossus and European mastiff family. They were originally used in Germany for bear and bull baiting. In the 19th century, the breed reached a certain amount of conformity following selective crosses between Great Danes and English Bulldogs. The origins of the name "Boxer" is unclear. Some believe it is a corruption of the German word "Beiszer" meaning biter of bulls, while others state it comes from the word "boxl", an alternate name for the now extinct Brabanter dog. General Appearance: Muscular body with no fat, solid, smooth coat and courageous. Color: Brindle, red or fawn with white markings on the muzzle, neck, chest and feet or legs. Black mask. Coat: Short, shiny and hard hair. Very tight to the body. Tail: Set high, usually docked and carried erect. Ears: Moderate size, set high, thin, lying flat and close to the cheek when in repose. Some countries allow the ears to be cropped to a point, not too broad and carried erect. Body: Square, curved ribs and the belly forms a curve towards the rear of the dog. The back is short, straight, broad and well-muscled. The Boxer is one of the best guarding breeds and they consider their family as theirs to guard. Boxers can be too boisterous for some owners and are more appropriate for an energetic handler or family. Inherited conditions of Boxers include eye problems, extra incisor teeth and heart problems. The owner should always buy from a reputable breeder to reduce the likeliness of these problems.